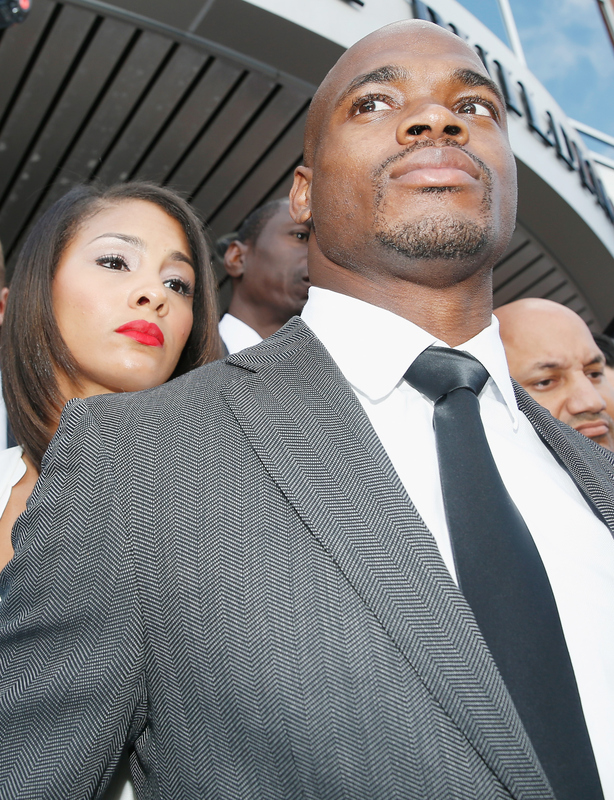 Adrian Peterson Gets Suspended From The NFL Without Pay For An Entire Year: "You Have Shown No Meaningful Remorse"
Tuesday wasn't a happy day for a certain Minnesota Vikings running back, that much is clear: The NFL suspended Adrian Peterson, without pay, for the year this morning, finally issuing their hotly anticipated decision on how best to discipline the superstar player. Peterson, 29, was indicted on a felony child abuse charge in September, when disturbing physical evidence, as well as text messages to his son's mother, indicated he'd beaten the four-year-old with a stick. He eventually pleaded no contest to a misdemeanor reckless assault charge in early November (which carried no mention of domestic or child abuse), and has been awaiting the league's decision ever since. It shouldn't come as much surprise that Peterson is getting a a firm rebuke from the league, and not just because his alleged and evidenced actions warrant them. While it'd be nice to think that NFL higher-ups are acting out of a sense of moral obligation, recent events make that a hard conclusion to draw. The league's infamously botched handling of the Ray Rice domestic violence case (which commissioner Roger Goodell is still in hot water over) may have all but forced Goodell's hand in issuing a harder punishment, to avoid the disastrous message given by the paltry two-game suspension Rice initially received. In explaining his reasoning behind the consequences for Peterson's crime in a statement, Goodell claimed that the Vikings star had shown "no meaningful remorse." You have shown no meaningful remorse for your conduct. When indicted, you acknowledged what you did but said that you would not "eliminate whooping my kids" and defended your conduct in numerous published text messages to the child's mother. You also said that you felt 'very confident with my actions because I know my intent. These comments raise the serious concern that you do not fully appreciate the seriousness of your conduct, or even worse, that you may feel free to engage in similar conduct in the future. I never imagined being in a position where the world is judging my parenting skills or calling me a child abuser because of the discipline I administered to my son. ... deep in my heart I have always believed I could have been one of those kids that was lost in the streets without the discipline instilled in me by my parents and other relatives. I have always believed that the way my parents disciplined me has a great deal to do with the success I have enjoyed as a man. I love my son and I will continue to become a better parent and learn from any mistakes I ever make. Of course, it's important to note that Peterson is speaking to his own history as an abused child, whether he necessarily wants to think of it that way or not. The phenomenon of generational and multi-generational child abuse is very familiar to psychologists and criminal pathologists alike. If you want some evidence, just listen to his mother's opinion on the matter — she told reporters in September that "When you whip those you love, it's not about abuse, but love." While that doesn't make his actions any less awful, it's worth remembering that he's been abused, as well, and may be in denial of that fact out of his feelings for his parents. It's a situation former NFL wide receiver Cris Carter articulated well in the aftermath of Peterson's indictment. My mom did the best job she could do raising seven kids by herself. But there are thousands of things that I have learned since then that my mom was wrong. This is the 21st century. My mom was wrong. She did the best she could, but she was wrong about some of that stuff she taught me. And I promised my kids that I won't teach that mess to them. You can't beat a kid to make him do what you want to do. Peterson, for his part, isn't happy about the league's decision, and that's understandable, despite being pretty unsympathetic — while 29-years-old is mid-career for most pro athletes, Peterson is a running back, and their abilities tend to wear down and severely atrophy around 30. The NFL Players Association has already announced they'll be appealing the suspension. Peterson has said he "will not allow the NFL to impose a new process of discipline on me," which is a comment to let swirl around in your head for a while. That aside, however, the core of his procedural complaint may carry weight — the NFL may be exercising authority outside the bounds agreed to in its collective bargaining agreement (CBA) with the players' union, in which case, you can expect the union to wage an ongoing fight on Peterson's behalf.